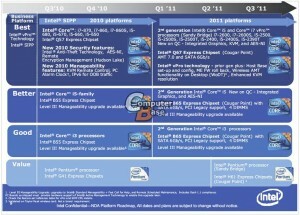 German Tech site Computerbase.de recently published an article showing ‘leaked’ Intel roadmaps for the Sandy Bridge based desktop and mobile CPUs and the new chipsets. 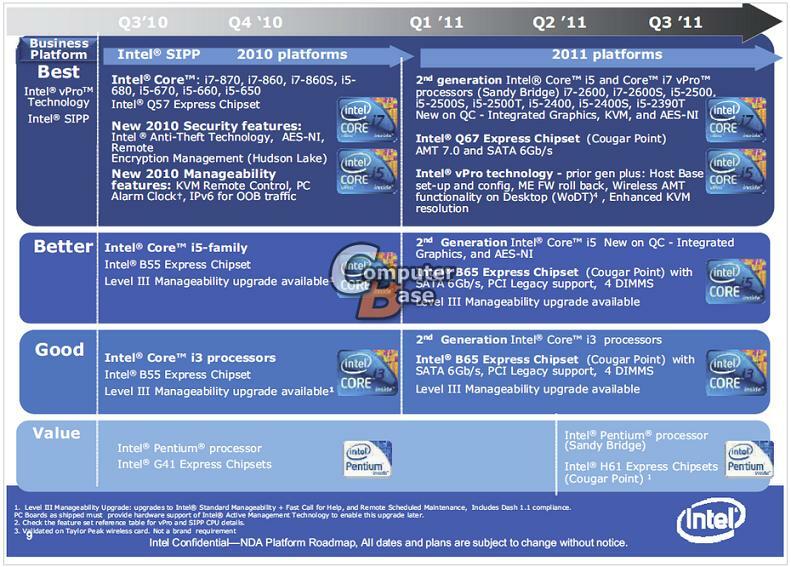 Sandy Bridge is the next generation of Intel processors, and although some details about important features are known so far, this is the first time we’ve been able to see exactly what is in the pipeline. 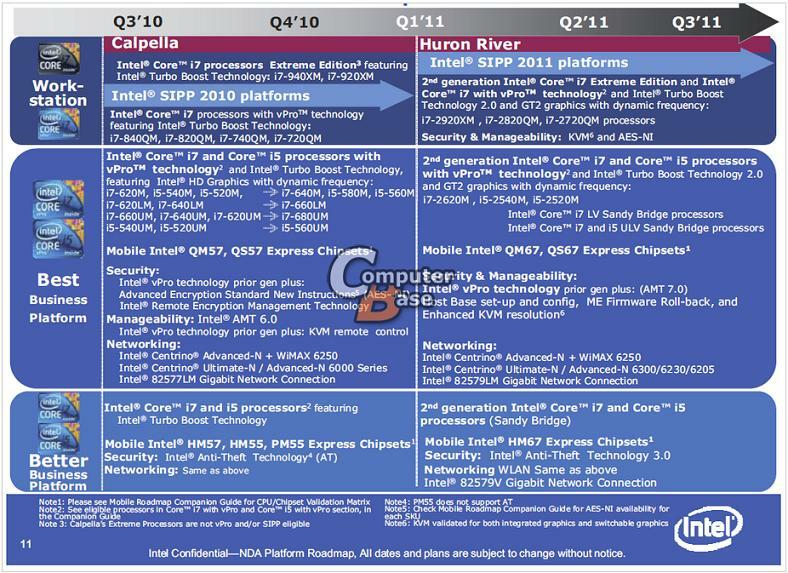 According to the roadmaps, we should all be looking forward to the Q67 and B65 (business platform) chipsets as well as a plethora of new CPUs. The Q67 and B65 chipsets, code named “Cougar Point” will use a new socket. Socket 1155 will presumably replace socket 1156. Other detailed information about the chipset features seem to vary from website to website; features such as SATA 6Gb/s support are widely reported, but the number of ports on each chipset is not clear. 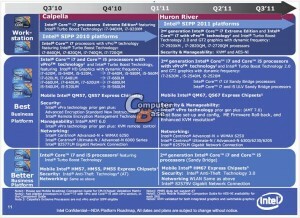 Below is a list from Computerbase.de that shows the naming of the Socket 1155 desktop and mobile chips. Its nice to see Intel continue to cater to the overclocking crowd by allowing presumably affordable unlocked multiplier CPU’s in their “K” series chips, in the same way that a couple of unlocked Core i5 and Core i7 models are currently available. 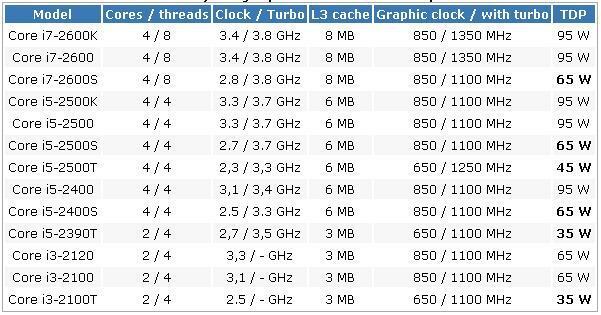 Although there is speculation that non-“K” series CPUs will be difficult to overclock, this new information does not shed any light on the rumors. All of the desktop chips are reported to include integrated graphics, in constrast to the current range where only the i3 and the lower end i5 have the GPU integrated. 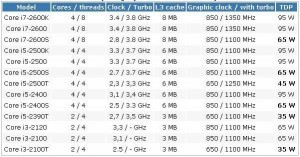 A number of ‘S’ and ‘T’ models are also reported, with 65 W and 35 W TDP instead of the usual 95 W. These might hopefully find their way into higher powered small form factor machines, or else perhaps yield more headroom for overclocking. Upon first glance, the 35 W TDP dual core mobile chips and 45 W TDP quad core mobile chips suggests that we won’t see a distinct change in heat output or battery life with Sandy Bridge based notebooks as this is in line with current i5-5xxM, i7-6xxM and i7-xxxQM chips. This assumption does not take into account other power saving features that might be included in these new chips, so stay tuned. All of this is very interesting, and we can’t wait to see how these chips turn out. Of course, we are also eager to know how they overclock! Now … where and when are the X68 and P65 slides going to leak ..?